The lilacs are in full bloom, and the sleeveless spencer and petticoat silk are lilac-colored! 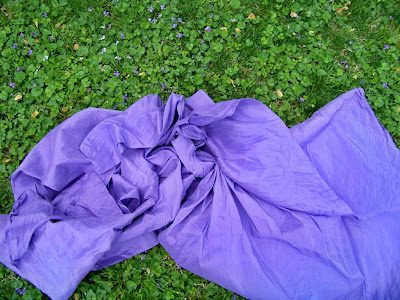 The silk is true lilac color, although I suppose, since it matches my violets, it could be called that color, too. It was dyed (from the same stash of old cream silk almost slubless dupioni I've had for years) in the washing machine with Idye from Dharma Trading. Easy to use and entirely mess free. The color of the silk when wet was MUCH darker than this, more a royal purple, so when using Idye at least, one must trust that the color will come out well. I was worried it would be too dark and wondered whether I had left it in the dye too long (30 minutes, less than the 50-60 that Idye suggested); had I taken it out earlier it would have been too pastel colored. As it stands, it's nearly the exact shade needed. You can read more about this ensemble in Making the Wrap-Front Dress Do Double and Triple Duty. 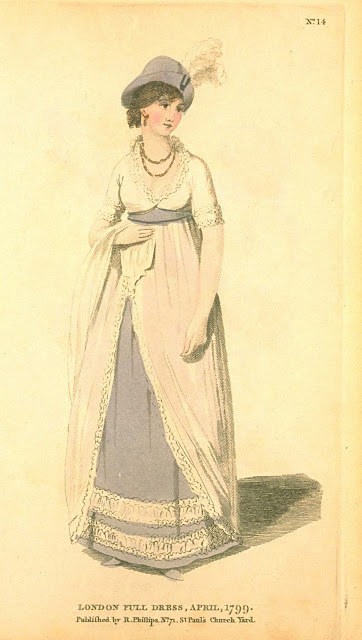 At the Jane Austen Festival in Louisville in July, I will probably wear an afternoon variation of this ensemble one day with my wrap-front dress -- with the petticoat showing and a day hat -- and on the other day will wear the sleeveless spencer over the wrap-front dress, with no petticoat showing. A third choice is to wear the petticoat and the spencer together, and add muslin sleevelets to the spencer. Love all the choices! 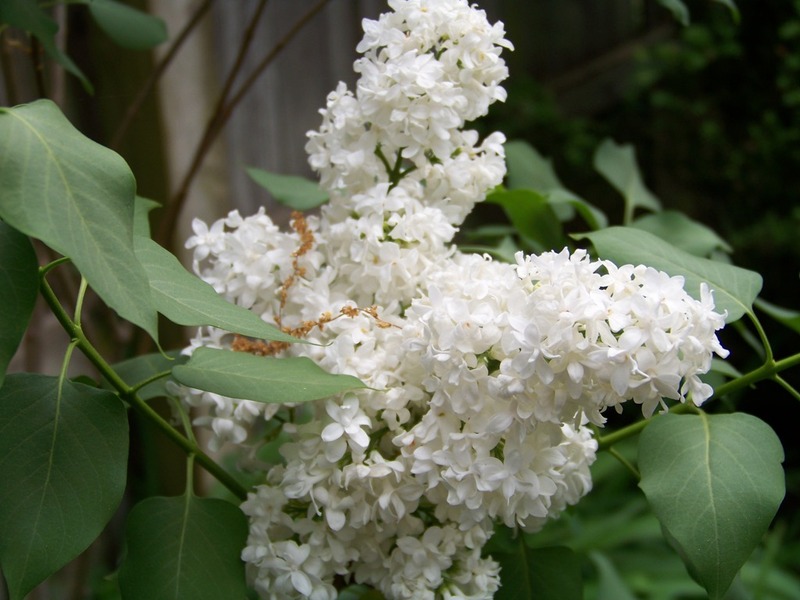 Here are the lilacs in our garden. No purple tint, but definitely a royal fragrance. Now for the new look. It's an experiment. Because I am doing so much embroidery, with more in the works, it seemed appropriate to feature embroidery in the blog design. Am not entirely happy with it: the header needs centering and I chose the background from a copyright-free image uploaded to Wikimedia Commons from the Victoria and Albert: it's a detail of a mantua's petticoat. The petticoat is from decades previous to "my" decades, and it needs Photoshop work. There are other glitches...more edits over time. 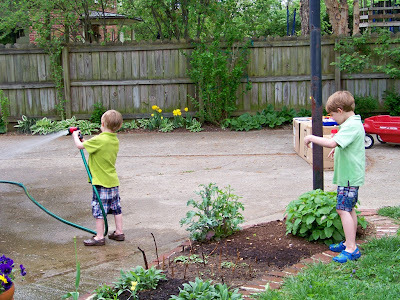 Shorts and almost swimming on April 4. ﻿ Will Mother Nature shout "April Fools"? good to know your sleeveless spencer will be a shade of blue i was contemplating blue myself but now i think i will use the magenta silk i have! can't wait to see what you come up with! Can't wait to see yours, too. This is the year for them, for I am hearing of them all over. It all looks gorgeous - we are heading into winter, and living in a city almost entirely devoid of deciduous trees, we get none of the glory of Autumn to compensate! PS Natalie did you know word verification is set to 'on'? No deciduous trees? No color? That is hard. Yet then you have green color all year long, and not just in conifers, right? There are times in winter when I long for greenery that isn't needles. Yup, I have word verification on. Used to get spam all the time, so this was the way around it. Sigh. Yes, they're a favorite here, too. Last night we got lucky: the forecasters predicted a frost, and I mentally bid my lilac blooms farewell, but the frost passed us over, and we are all relieved.